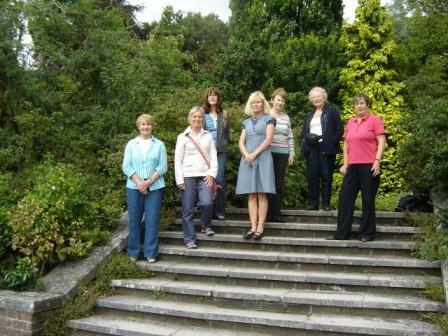 On Monday 20 July 2009, eight Friends of the Porter's Garden met at Fratton railway station to begin their trek to NW3. We arrived at Golders Green underground station and walked up the hill to Golders Hill Park where we had our picnic lunch. Then a short walk through the park took us into the Hill Garden. The garden is at the rear of Inverforth House, formerly the London home of Lord Leverhulme and now divided into apartments. The site was first laid out in 1896 and redeveloped in 1910. The pergola in Hill Gardens The marvellous Grade II listed 800ft colonnaded pergola was designed by Thomas Mawson and was refurbished by the City of London in 1995. Doric columns of Portland stone support oak beams 30 ft above the garden along which wisteria, clematis, roses and jasmine intertwine. It is punctuated along its length by airy arbours and cupolas. 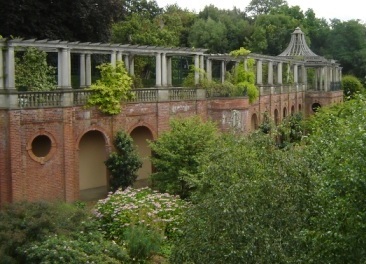 A short bus ride away is Kenwood House and gardens originally designed by Humphrey Repton. 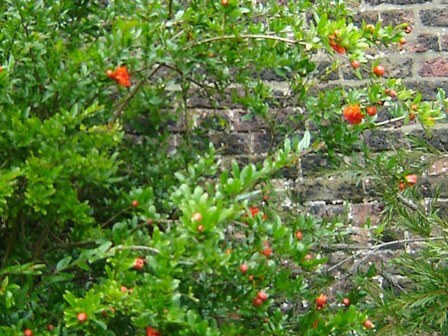 Here, we enjoyed tea, the splendid views over London and Hampstead Heath and a stroll around its walled kitchen garden, which now contains mainly flowers including a pomegranate tree with its lovely scarlet flowers. Pomegranate in flower in Kenwood House kitchen garden A sculpture by Barbara Hepworth was much admired but not well understood on the way out. 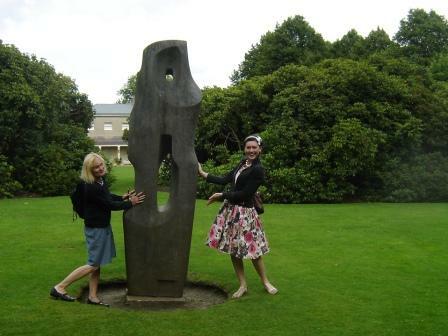 Val and China-Rose with Barbara Hepworth's sculpture Monolith Empyrean The sculpture's name Monolith Empyrean literally means "Heavenly stone". We stopped off at the Festival Hall for some refreshment before completing our journey home after a very enjoyable day out with thanks to Margaret Judd for organising it.